I'm really pretty gobstruck by this story. For the 12 longest years of my life, Michael Bloomberg had mayoral control. This basically meant Michael Bloomberg could do what he wanted, when he wanted, how he wanted, and as much as he wanted. The three-year-old child in him must have been thrilled. No more of that ridiculous democracy impeding him getting things his way, and no more communities voting in people who thought they should have control over the schools in their communities. But then, after Bloomberg bought himself a third term against the twice-voiced will of the people, he couldn't or wouldn't purchase a fourth. And the people of New York rose up and voted for a mayor who was against charter schools. Of course, Andy Cuomo, who took tons of cash from charter schools, wasn't having any of it, so he passed a law, applicable only in New York City, that said we had to pay rent for the charters we didn't want. This, of course, was after they tried to pass a bill killing seniority rights for teachers in New York City only. Anyway, Governor Andy's BFFs in the State Senate decided they'd offer mayoral control to de Blasio, that hippie commie weirdo, for only one year. But it was important that he have an "inspector" so that Cuomo could question every move he made in case it weren't reformy enough. 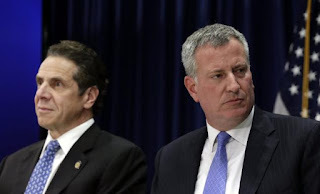 And waddya know, this bill would sunset in a year so that Bill de Blasio could interrupt campaigning to beg Andy, who hates his guts, to renew it again. You know it's funny how little faith people have in all the We, the People stuff nowadays. I mean, Bill de Blasio could stand up and say that the people who, you know, actually patronize the schools ought to have a voice in how they're run. That's what I think, and that's why I oppose mayoral control. Of course I also oppose it because it's really designed to circumvent democracy and allow the reformies to do Whatever They Damn Well Please with our students. That's why I really wish de Blasio would let it go. But Andy Cuomo wants to make it worse. You see, what with all that money Andy takes from Moskowitz BFFs, he wants to make sure that de Blasio, who was overwhelmingly elected, doesn't get to actually do what he promised he would when elected. Essentially mayoral control is absolute. The mayor gets the last word and that's it, no questions asked. Unless the mayor doesn't do what Eva Moskowitz wants in which case Daddy comes to the classroom and embarrasses you every time you make a decision. Now if Andrew Cuomo gave a golly gosh darn about We, the People, he'd create something other than the ridiculous PEP, where the public gets to say a few words and the fake school board then does whatever the mayor has told it to. But what Andrew Cuomo cares about is Andrew Cuomo, and he wants everyone under his thumb, not just We, the People, but also He, Bill de Blasio. As far as Andrew Cuomo is concerned, We, the People, can go straight to hell. And frankly, it serves us right for allowing such a megalomaniacal, narcissistic, self-serving, self-centered, grasping, juvenile windbag to be our governor. Mayoral control was always a mistake, and the best outcome here would be its expiration. I won't mourn it.